​Tomato sauces are used in many products including frozen foods, pasta sauces and pizza toppings, etc. A typical tomato sauce would be based on sieved or whole tomatoes, and/or tomato paste. It would also contain water, sugar, vinegar, salt and seasoning. The desired product viscosity would normally be achieved using a starch-based thickener. Tomato ketchup is a condiment manufactured from similar ingredients, although paste is used rather than whole tomatoes. Premium quality ketchups with a high solids content derive their viscosity from a combination of water retention of the fibrous strands in the paste and the gelling effect of pectin found naturally in tomatoes. High pressure homogenization is also used to obtain the desired viscosity. This is common with lower solids content ketchup, which may also contain starch-based thickeners. Mixing apparatus must be capable of dispersing powdered ingredients into water to form an agglomerate-free product. If the product is made from whole peeled tomatoes, these require chopping and pulping before addition to the mix. Insoluble particles in the tomatoes need to be fully dispersed and “milled” to obtain a smooth texture and even dispersion of the pigment (carotin) to give depth of color. Fibrous strands in the tomatoes must be fibrillated (frayed) to raise capacity for water retention, which increases viscosity. Once mixed, the product may be passed through a high pressure homogenizer or colloid mill to obtain the required consistency. Additives designed to thicken the product tend to form agglomerates which agitators cannot easily break down. Partially hydrated ingredients can build up on the vessel wall and parts of the mixer. Long mixing times are required to achieve complete dispersion. 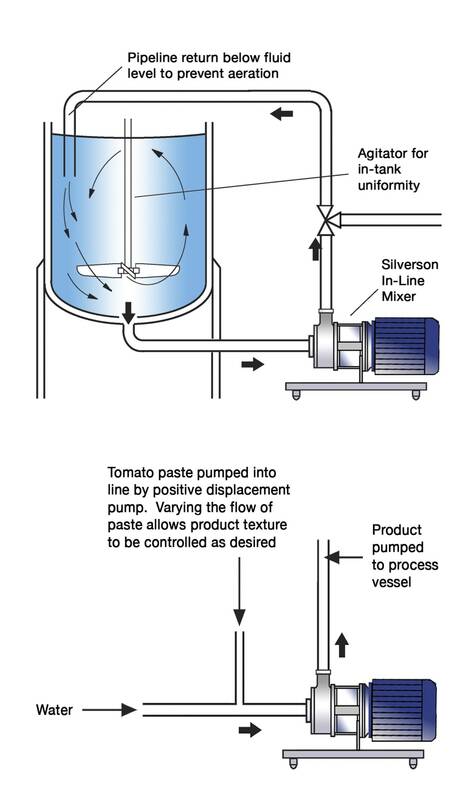 Long mixing times are required to dilute tomato paste into water, as agitators cannot easily blend liquids of widely differing viscosity. 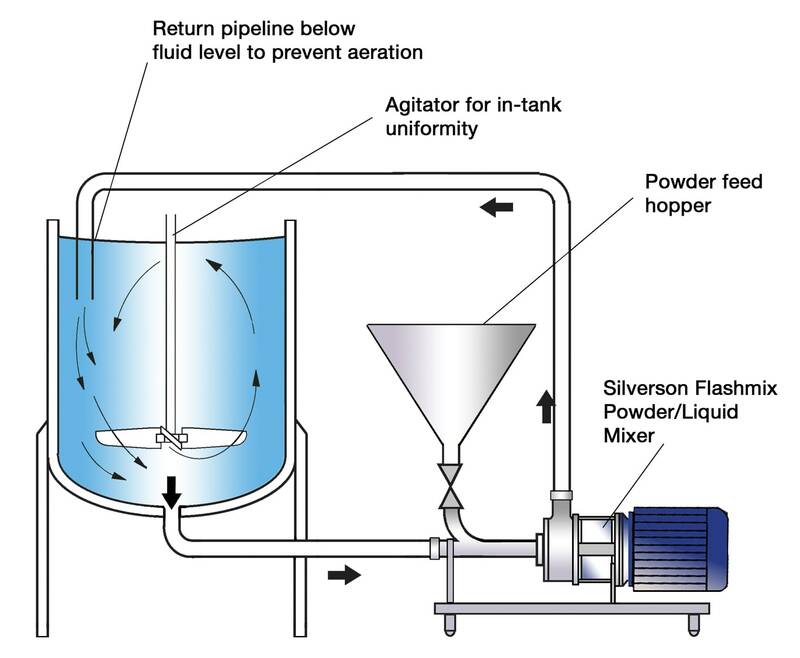 A uniform pre-mix is required by the homogenizer. This is not easily achieved using agitators. 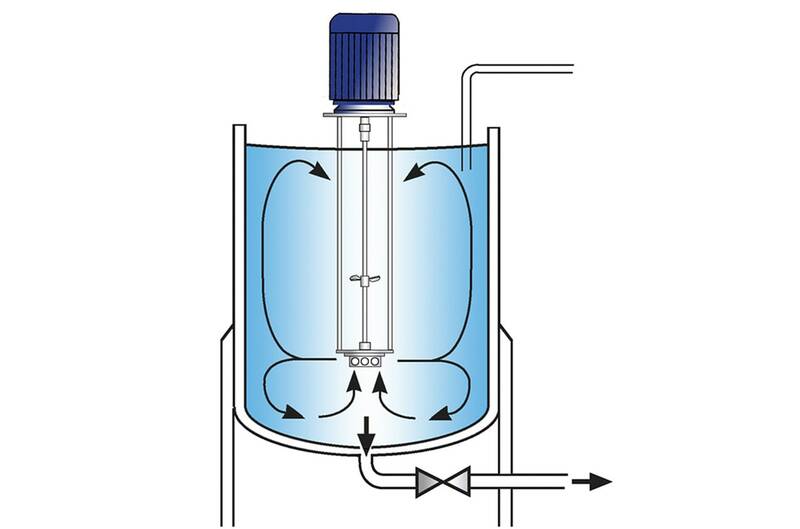 Several runs through the homogenizer or mill may be required to obtain the desired product. Excessive homogenization pressure can break down fibers, damaging water retention properties, causing separation and adversely affecting color. Homogenization and other handling can dull the finish of ketchups. Tomato pips contained in products using whole tomatoes can be crushed during milling, imparting a bitter taste. The vessel is charged with water and the Silverson mixer is started. The powdered ingredients are then added. The high speed rotation of the Silverson mixer creates a powerful suction which draws the liquid and powders into the workhead. The materials are subjected to intense shear within the workhead. Agglomerates are broken down between the ends of the rotor blades and the stator wall. The product is forced out through the stator and returned to the mix. Fresh materials are simultaneously drawn into the workhead, maintaining the mixing cycle. The circulatory mixing pattern ensures that hydration of the thickening agents is rapidly completed. The tomato paste is then added and dispersed in the same manner. Whole peeled tomatoes can be added to sauce mixes. These are disintegrated by the Silverson mixer without prior chopping or pulping being required. The insoluble particles are finely reduced and dispersed throughout the product. A homogeneous mixture is rapidly obtained.